Many Alley donors have found monthly giving via credit card to be a very convenient method to support the theatre over time. Each month, the Alley will charge your credit card the amount specified by you. Donors who contribute monthly are recognized as Sustainers. Contributing gifts of appreciated stock can be very beneficial for the donor's tax situation. Please contact Mary Kay Wittrock at marykayw@alleytheatre.orgor via phone at 713.315.3371 for transfer instructions. Contributions made on our website are growing each year. It is a fast and convenient method to make a contribution. Click the DONATE button to make a gift online. Or, you can text ALLEY to 41444 to make a contribution and put your dollars to work immediately. Contributions of cash, check or credit may be mailed to the address listed in the "Contact Us" section below. Donors may call the Development Department directly to make a pledge or give a gift via credit card. Please call Joseph Roberts at 713.315.5408. Faxes may be sent to the Development fax at 713.315.5471. Many companies support their employees and local non-profits through matching gifts programs. Contact Joseph Roberts at josephr@alleytheatre.org for more information about matching gifts from your employer. Complete a matching gift form with your company and your contribution will have double the impact! Donor Advised Funds allow donors to make a gift of cash, stock or other long-term appreciated assets to a community foundation or financial institution that sponsors a donor-advised fund program, be eligible for an immediate tax deduction, and can then recommend grants over time to any IRS-qualified public charity. To learn more or make a gift to the Alley from your donor advised fund, go here. Annual Fund donors play an important role in the life of the Alley Theatre. Donor contributions tie directly to what you see on stage and what happens with students in classrooms across our community. Everything you see on stage was created and built at the Alley Theatre Center for Theatre Production. We make our costumes, build our sets and maintain a resident company of actors. All of this is made possible through your belief in what we do is worth your investment of time and financial support. Donors develop a special relationship with the Alley when they participate in one of our patron groups. Enhance your theatre experience by joining one of our patron groups. The Alley’s Education and Community Engagement (ECE) programs encourage creative expression and participation in the theatre arts, promote math and science learning, improve critical literacy skills, foster personal growth and celebrate Houston’s heritage and cultural diversity. Last season, the Alley Theatre provided a record 542,454 educational contact hours to students, educators, patrons and community members. Our touring shows and educational programs served 80,000 students and 3,630 teachers from 264 schools and 25 independent school districts throughout Greater Houston. Donor support makes these activities possible. You can designate your support be used for education and help our communities' children reach their full potential. Staging STEM: a program that integrates theatre in K-8 science and math classes for 50 elementary schools across Greater Houston. Partner School Program: allowing schools to tap into the Alley’s resources by offering 11,279 students and 169 teachers professional theatre residencies and workshops. Alley Character Education Series (ACES): bringing live theatre into over 70 classrooms, impacting 42,242 students. Student Matinees: 8,644 students received the opportunity to experience a play for the first time. Backstage Tours: 451 students and 36 teachers participated in a behind-the-scenes tour of the theatre. Professional Development: for 417 educators in math, history, English, science, theatre and speech. Kennedy Center's VSA Playwriting Discovery Program: offering 78 classes for 131 students with disabilities in Houston. Alley Jr. & Sr. Conservatory: 57 students were trained by some of the best actors, directors and playwrights the Alley Theatre has to offer. 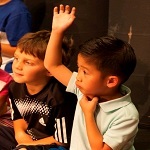 Play Makers: a theatre and playwriting camp for 380 Kindergarten-8th Grade students. TYPE (Texas Young Playwrights Exchange): discovering the voices of 6 young dramatists. Theatre Internships: 25 students and young professionals interned at the Alley Theatre administrative office and Alley Theatre Production Center. Artist Talkbacks, Designer Talks, and Alley in Context: 7,457 audience members participated in pre- and post-show discussions. School Nights/Partnership Ticket Program: 111 schools received discounted tickets to School Nights and Student Matinee performances. Every play you love was new once. And the first draft was not the draft you saw. As the Alley Theatre enters a new chapter in its renovated building, it proudly launches a new work initiative starting with Alley All New, a festival which will present workshops and readings of new plays and musicals in process. The writers will be in residence to develop their work with the assistance of actors, directors, and bare bones design elements. Over the course of two weekends, audiences and artists will have the opportunity to engage with the development process, see the shows, and meet the artists. Donor contributions are vital to the development of new work. You may designate that your gift support new work in the notes section of the donor form.